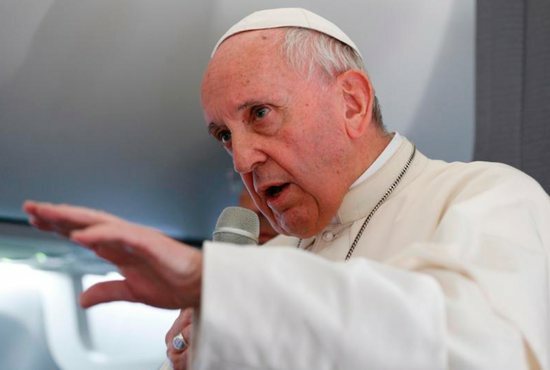 Returning to Rome from a trip Sept. 22-25 to the Baltic nations, Pope Francis was asked about his remarks to young people in Tallinn, Estonia, when he said young people are scandalized when they see the church fail to condemn abuse clearly. “The young people are scandalized by the hypocrisy of adults, they are scandalized by wars, they are scandalized by the lack of coherence, they are scandalized by corruption, and corruption is where what you underlined — sexual abuse — comes in,” the pope responded. The fact that child abuse occurs in many environments does not in any way lessen the scandal, he said. To understand what happened in the past, he said, one must remember how abuse was handled then. “The past should be interpreted using the hermeneutic of the age,” Pope Francis said. People’s “moral consciousness” develops over time, he said, pointing to the death penalty as an example. In fact, the pope said, he has encouraged bishops to report cases to the Congregation for the Doctrine of the Faith, and he “never, never” granted amnesty to a priest found guilty of abuse. Pope Francis did not mention by name Archbishop Carlo Maria Vigano, the former nuncio to the United States, who claimed that Pope Francis knew of and ignored the sexual misconduct of former Cardinal Theodore McCarrick. And the journalists’ question about Archbishop Vigano was never asked because the pope insisted that most of the questions be related directly to his trip to Lithuania, Latvia and Estonia. Reporters also asked the pope about the Vatican-China agreement for the nomination of bishops, which was announced Sept. 22 while the pope was in Lithuania, and about the suffering of Chinese Catholics who had risked their lives to remain faithful to the pope and not accept the communist government’s control over the church. Some Catholics in China “will suffer” and feel betrayed, he said, “but they have great faith” and in the end will trust the pope. Pope Francis praised the team of Vatican negotiators who worked “two steps forward, one step back” for 10 years, but he insisted he bore all responsibility for the agreement and, especially, for regularizing the situation of seven bishops who had been ordained without Vatican approval. With every “peace treaty” and every negotiation, he said, “both sides lose something” and for the Vatican that was complete control over the nomination of bishops. However, he said, people should remember that for centuries the kings of Spain and Portugal nominated the bishops of Latin America, and the Austro-Hungarian emperors did the same in their territory.